value The position between min and max. size How much can we see? topValue The value at the top end of the scrollbar. bottomValue The value at the bottom end of the scrollbar. style The style to use for the scrollbar background. 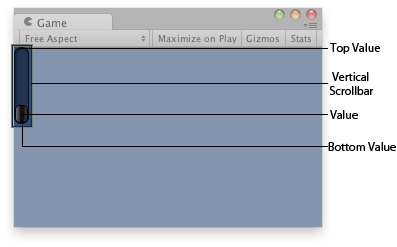 If left out, the horizontalScrollbar style from the current GUISkin is used. float The modified value. This can be changed by the user by dragging the scrollbar, or clicking the arrows at the end. A scrollbar control returns a float value that represents the position of the draggable "thumb" withtin the bar. You can use the value to adjust another GUI element to reflect the scroll position. However, most scrollable views can be handled more easily using a scroll view control. Vertical Scrollbar in the Game View. The styles of the scroll buttons at the end of the bar can be located in the current skin by adding "upbutton" and "downbutton" to the style name. The name of the scrollbar thumb (the thing you drag) is found by appending "thumb" to the style name. // MyVerticalScrollbarupbutton    - Name of style used for the up button. // MyVerticalScrollbardownbutton - Name of style used for the down button. // MyVerticalScrollbarthumb         - Name of style used for the draggable thumb.